Elvis is a DAM system created by WoodWing that enables creative teams to produce unique assets for a wide variety of channels. The solution enables creative individuals to work faster, as assets they need to produce media are within easy reach. With Elvis DAM, companies with dispersed members have a single interface in which to collaborate on. The solution has an open platform that is highly scalable so it seamlessly fits into a business’ workflow. In addition, Elvis DAM utilizes modern technology that gives users the power to rapidly find the files they need and integrate with any third-party program. This includes InDesign and Photoshop, two creative software that are integral to the workflow of creative teams. With their connection to the platform, a team is able to seamlessly collaborate and expeditiously create media for any screen. Elvis DAM’s system enables creative teams to produce unique media faster. Sharing files across the organization is more rapid with this system as uploading is quick, therefore other members access assets faster. Elvis makes managing media assets more stress-free. Companies with pre-existing folder taxonomies can recreate the same system in the platform, thereby eliminating the need to adopt a new file management structure. This way, members become more productive since they do not need to relearn their file organization arrangement. Elvis DAM utilizes Elasticsearch technology, a powerful search engine that is even used by Facebook, Netflix, and Wikipedia. With this feature, team members can rapidly pull up the relevant file they are looking for using a variety of filters. This enables them to swiftly finish projects, thus saving the company time and money since overtime work is reduced. Users appreciate Elvis DAM’s ability to become an integrated work station. Within its interface, dispersed team members are able to work together without having to exchange emails and share tools. This way, they can cooperate effortlessly on any and all creative projects. 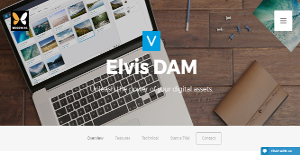 With Elvis DAM, creative companies can publish their media assets across all channels. The solution itself automatically converts and scales media into the right size and format to perfectly fit with the channel it is intended for. This saves them the trouble of having to run other programs simply to convert files into the correct format and enables them to rapidly share unique content. Elvis DAM affords users a high level of flexibility when it comes to customizing their interface. The solution gives companies the power to create their own custom brand portal wherein workers throughout the company can access the media they need. Instead of having to send links or files via email, they simply have to visit the portal. Elvis DAM protects media assets by allowing administrators control over user access rights and permissions. This way, sensitive information are available only to those whose accounts have the right rules. Elvis’ APIs allow integration with any kind of third-party software. This is especially useful for connecting the solution with creative programs like Photoshop and InDesign for a more streamlined media asset management. Furthermore, the system’s APIs afford teams a high level of customization as they can integrate with a limitless number of external solutions. If you are considering Elvis it might also be beneficial to investigate other subcategories of Best Digital Asset Management Software listed in our base of B2B software reviews. Every company has different wants and needs an application that can be customized for their size, kind of staff members and customers, and the specific industry they are in. For these reasons, no platform can proffer perfect functionality off-the-shelf. When you try to find a software system, first be sure what you require it for. Read some Elvis reviews and ask yourself do you want basic features or do you want sophisticated tools? Are there any industry-specific features that you are searching for? Find the answers to these queries to aid your search. There are plenty of aspects that you need to consider and these include your finances, particular business needs, your organization size, integration needs etc. Take your time, try out a few free trials, and finally select the app that provides all that you want to boost your organization efficiency and productivity. How Much Does Elvis Cost? Complete enterprise pricing information for Elvis DAM is only available upon request, though the lowest amount a company has to pay for the solution is $97/month. Creative organizations can choose between an on-premise solution, a private cloud-hosted system, or a cloud-based software. We realize that when you make a decision to buy Digital Asset Management Software it’s important not only to see how experts evaluate it in their reviews, but also to find out if the real people and companies that buy it are actually satisfied with the product. That’s why we’ve created our behavior-based Customer Satisfaction Algorithm™ that gathers customer reviews, comments and Elvis reviews across a wide range of social media sites. The data is then presented in an easy to digest form showing how many people had positive and negative experience with Elvis. With that information at hand you should be equipped to make an informed buying decision that you won’t regret. What are Elvis pricing details? What integrations are available for Elvis? Elvis DAM has REST API and Webhooks API that allows companies to integrate with numerous third-party software. Common integrations are Adobe InDesign and Photoshop. For more information regarding this feature, get in touch with WoodWing support.